And now the big news! 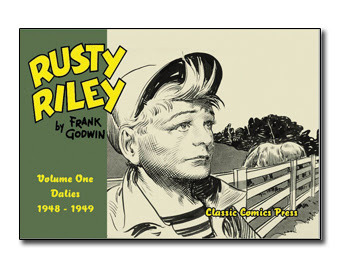 I have decided to publish Frank Godwin's Rusty Riley Volume 1 - The Dailies in hardcover, with 16 pages in color. Due to these changes the book will not be published until Spring of 2013 and the price per copy will be $29.95. For those who have pre-ordered the book from the Classic Comics Press website - your original orders at the originally listed price will be honored. I know a lot of you have been waiting a long time for the first volume, but take heart - it's happening and I'm sure you'll all agree it was well worth the wait.